Hi Folks: We're back after a longer than expected break due to various things happening in real life. The new year on the hobby front appears to have kicked off with a very solid start with the plethora of new Nurgle models available. The one that caught my eye the most is the new Great Unclean One. And the main reason that it caught my eye was that it seems to harken back to the older Realms of Chaos era. The image above shows one such example of the Realms of Chaos era Great Unclean One. This is a metal monster, standing a bit taller than a modern space marine (or Primaris marine). There are a number of salient features that this model has and is shared with the newer, larger plastic one. These include the belly tear and the possibility of that tear being turned in to a maw for chomping on nearby Nurglings (or others) that was featured in a different metal model. The snake like tongue is also an interesting feature. However, the more things stay the same, the more that they change as well. The biggest change (pun not intended) is the sheer scale of the new plastic Great Unclean One. It is literally huge and towers over the older, metal versions of the model. The model retains the weapons (swords, etc.) that are not seen in the Realms of Chaos version. I think this is a good thing as it gives the threat level a big increase visually over the older metal ones which just seems to be pointing and gesticulating in an unfriendly (or maybe even friendly?) manner across the gaming board. Also retained are the Nurgling additions. 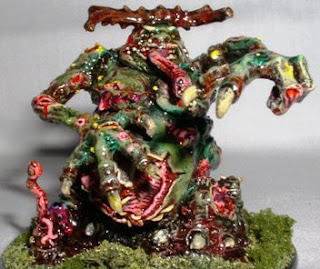 These have almost always been an addition included in many of the sets over the years and can be used to decorate the bases and various critical nodes of the Great Unclean Ones (and more besides). I wrote a while ago that I was concerned that the Death Guard was increasingly looking more like cartoon villains. This is not the case with the Great Unclean One, but I do worry it seems to be the case with the new Plague Bearer heralds. These seem to be continuing along the line of comical. I will freely admits that Nurgle does have some jovial interpretations. However, there's a difference between a gruesome figure looking jovial, to what should be a gruesome figure appearing a bit too comical in nature. So for me, the Great Unclean On is sheer win and I might even purchase it. But not so much the Plague Bearers that have been released. More ramblings soon (probably Dorn related! ).